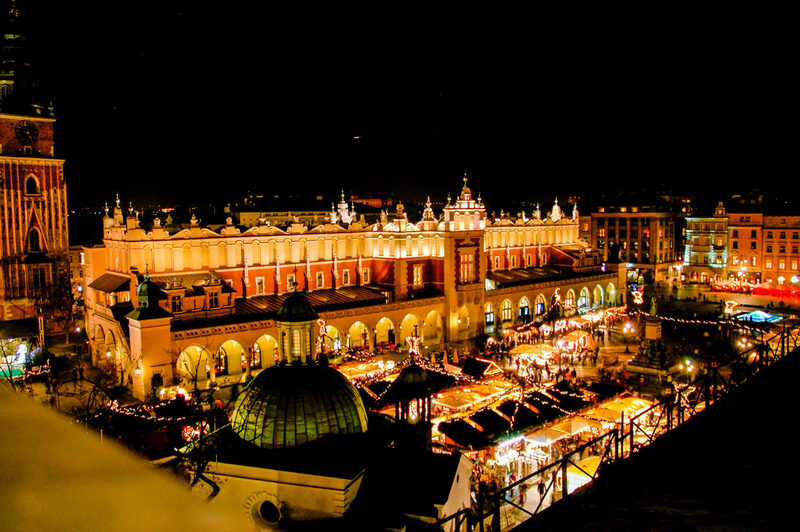 Each year Krakow is hosting the largest Christmas Market in Poland. It takes place in the Main Square, the heart of the historic Old Town. Christmas markets have always taken place there, since it has always been the major trade venue, annually welcoming festive merchandise as the Christmas time approched. Tens of wooden stalls are installed in the Main Square and special festive activities are planned. This year there will be no exception! A huge, luminous Christmas tree will invite everyone to participate in this year’s Christmas Market. Amongst arts and crafts on sale can be found hand-made jewellery, Polish pottery and woolen clothes as well as hand-painted colorful glass baubles that are Polish traditional Christmas decoration. Wreaths and evergreens are another popular Christmas ornament. A visit at the Christmas Market can also be a great excuse to try a wide range of traditional Polish food goodies. Vendors offer mulled wine and warm beer with sausages for those wanting to warm up a little. Christmas Market is also the best way to try seasonal sweets, from heart-shaped gingerbreads to multicolored candies and nuts in caramel. Many special events are planned to accompany the fair, such as folk dances and carols singing contests. Local blacksmiths and other craftsmen provide free entertaiment, presenting how they work and encouriging visitors to purchase their handicraft. Also a very special guest, Saint Nicolas, will surely be present to pose with children. 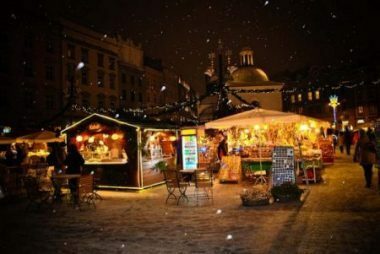 The exact dates of this year’s Krakow Christmas market are yet to be announced. 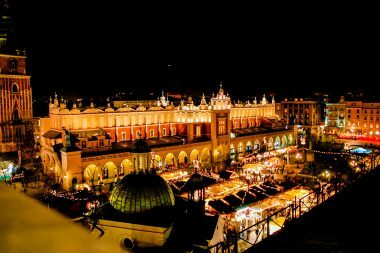 The vendors generally keep their stalls open every day between 10 a.m. to 8 p.m.
Christmas is the most important holiday in Poland therefore Christmas time is always widely celebrated. One of the most cheerful Christmas time highlights are Christmas Markets. In Krakow, one of the biggest cities in Poland and it’s ancient capital, they has always been exceptionally festive. Traditionally, start of Christmas Market launches the festive season. They start at the end of November and last at least until Decembert 26th. Sometimes the market runs until January 6th, important Catholic holiday, Epiphany, in Poland commonly called as Three Kings Day. Christmas celebrations in Poland are strongly connected with holidays in Catholic Church. They culminate on December 24th , Christmas Eve and on two Christmas days, December 25th and 26th . Christmas spirit is being felt for the whole month. Streets are decorated with colorful lamps, Christmas trees are installed on city squares, shops and restaurants put up their most festive decorations. Carols and Christmas songs are played in radios and it is impossible not to get in this special holiday mood. People in their homes prepare for Christmas as well and Christmas trees decorated with glass baubles appear in every Polish home. For many Poles, Christmas time means celebrating Lent. People gather in churches and attend special Christmas masses to pray and find solitude. In Lent people also prepare specific food, they often abstain from eating meat and drinking alcohol. Lent ends on Christmas Eve, when families gather together for festive supper. This is usually a day for gifts exchanging and happy celebrations. The most popular Polish tradition is decorating Christmas trees with colorful baubles, garlands and lamps. A lot of families do this on Christmas Eve, but in the Christmas spirit many are so anxious to start their holiday celebrations that they install Christmas trees weeks before December 24th. The Christmas tree plays an important part during Christmas Eve, since it is where gifts for all family members are placed. On Christmas Eve people gather at homes for a special Christmas supper. Celebrated with friends and family, Christmas Eve is the most important and tasty day of Christmas. Preparing festive food, eaten only in this time of the year, lays deeply in Polish culture. Traditional Christmas Eve supper consists of twelve dishes. The supper begins with a breaking of the opłatek (Christmas waffer) and wishing one another merry Christmas. The most significant of Christmas dishes are beetroot soup with uszka (small dumplings filled with mushrooms), pierogi, sauerkraut and fried carp. Kutia, mixture of nuts, seeds and grains, combined with honey and some red wine is served as dessert, alongside with gingerbread and poppy seed cake. In Catholic families, bits of hay are spread beneath a tablecloth as a reminder that Christ was born in poverty. One additional plate setting is usually left at the table for a lonely wanderer, as during Christmas people should be selfless and helpful. Traditional Christmas food is always sold on Christmas Market. Delicious pierogi and sauekraut are offered by number of vendors, as well as gingerbread. There are also certain traditional Polish Christmas attributes, which can be found on the Christmas Market. One of them is hay to be put under the tablecloth. Another is a Christmas candle, usually white or red, that is lit during Christmas Eve supper. Cards exchanging is popoular in Poland. People send them to their relatives living abroad or give to friends and colleagues. Christmas Market offers a wide selection of hand-made Polish Christmas cards. Buying souvenirs in the Christmas Market is a way to suprise someone with a unique gift and bring home a piece of Polish tradition. 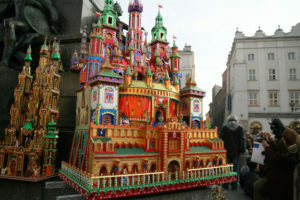 What makes Christmas in Krakow one of a kind are Szopki, a custom completely unknown in other parts of Poland. 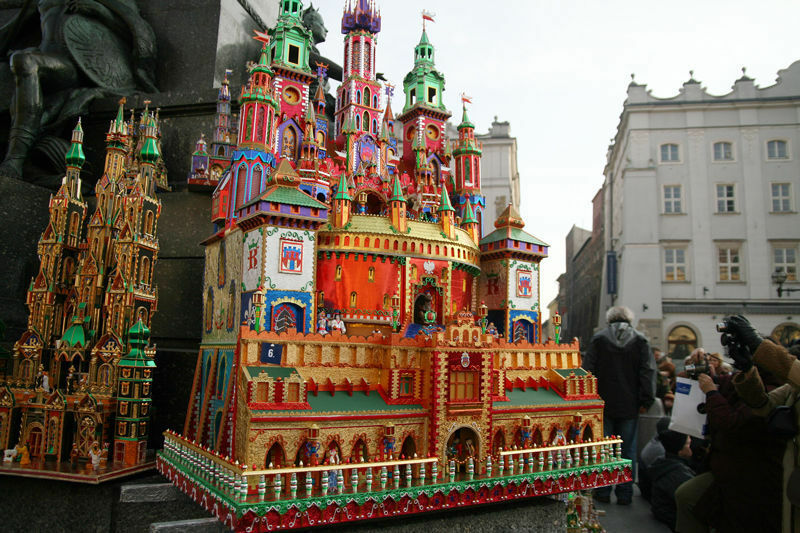 These miniature models of the Nativity Scene and Krakow’s historical buildings are made of colored paper and wood. Szopka is a sleek, tall, multilevel tower, often very colorful and usually combining the scene of the birth of Jesus with significant elements of Krakow’s architecutre. It is a local custom, dating back to the 19th century, characterictic only to the Krakow region. Each year, on first Thursday of December a competition for the best Szopka is held on the Main Square, an event extremely popular amongst locals. The most elaborate and beautiful works are then displayed on a special exhibition in Krzysztofory Palace, which is a branch of Historical Museum of Krakow.